The EMU Australia Brumby Lo is a mid calf sheepskin boot for kids that’s comfortable, warm and ready to leap into puddles. Made with waterproof suede and lined with real Australian Merino wool, these sheepskin boots for children are easy to slip on and off, with winter ready grip and traction. The Brumby Lo comes in classic colors such as black, tan and gray, as well as more colorful options like navy and green. Great for splashing around in puddles, the Brumby Lo is a versatile, mid calf boot for kids. Fully waterproof and lined with 100% real Australian Merino wool for a warm and cozy fit, so they can also be used as a snowboot for kids. 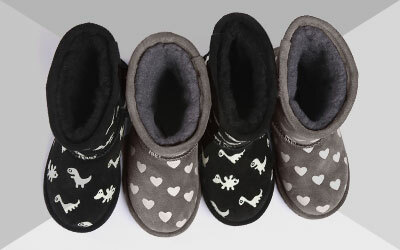 These sturdy waterproof sheepskin boots offer cushioning so they’re super soft and comfortable, and superior support and breathability, so the children’s feet stay warm in the cold of winter and cool in the summer. Perfect for protection against rain and snow, the Bumby Lo is available in classic colors such as Oak brown, Midnight navy, Khaki green, Charcoal gray and Black. 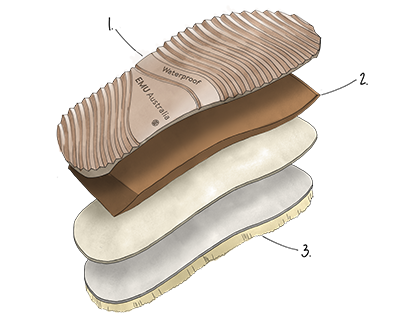 You can feel the EMU difference in all of our sheepskin boots, with our superior double stitching and finest quality materials. The Brumby Lo for kids is no exception, and is also Woolmark accredited.